The building is open Wednesday to Sunday from 11 am until 3pm unless there is no exhibition in the hall. See exhibitions. The Goods Shed is reached via Cirencester Road. 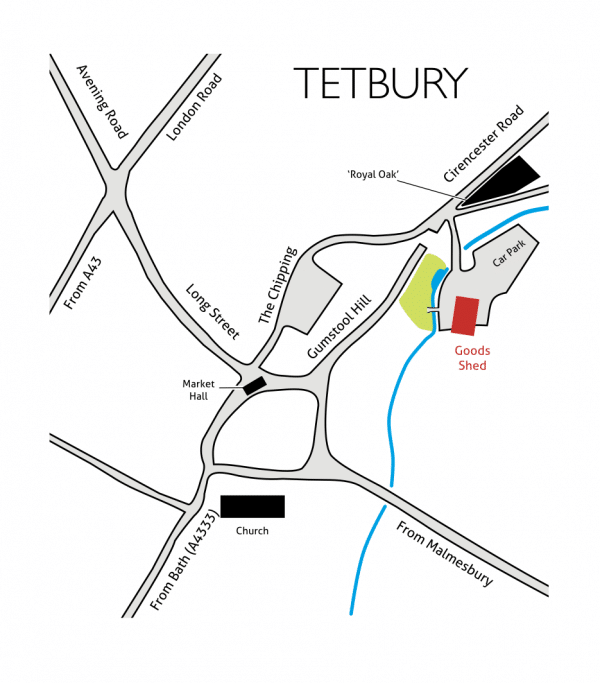 From the centre of Tetbury by the Market Hall, follow the signs to the free Long Term Car Park – turn between The Snooty Fox Hotel and Quayle’s delicatessen. The slip road by the Royal Oak Pub, through the white gates, leads directly to the car park and the Goods Shed. If you’re using SatNav, our postcode – GL8 8EY – will bring you to the gates on Cirencester Road leading to Old Station Yard. Please don’t try to drive to the car park via Gumstool Hill. It is a dead end with no vehicular access to the car park and no parking. To submit you must agree to our T&C's, you can view these by clicking the Terms & Conditions link above (opens in a new browser tab). I agree to Shed Arts to contact me via phone. I agree to Shed Arts to contact me via email.